This is one of the best books I’ve read in recent years, and one of the most emotional. I bought this book at Goodwill ages ago and kind of forgot about it (oops) until a few weeks ago, when the trailer for the film adaptation came out. The film stars some of my favorite actors, and the trailer captured my attention, so I dove into the book. I devoured it in three days. Totally worth reading. Let me start off by saying that I don’t read a lot of romance. Heck, usually the only way I’ll read romance at all is if it’s masked as something else. With that being said, I am head-over-heels for this beautiful book. It’s a love story, yes, but it’s so much more than that, too. It’s a story of hope in the face of hopelessness, perseverance against all odds, and discovering the meaning of a life fully lived. What got me most about this book is how unpretentious it is. As far as books go, it doesn’t seem extraordinary at face value. With some other books I’ve read and enjoyed, I found myself marveling at the author’s expertise and skill, the way they’ve crafted the world of the story. With Me Before You… that didn’t happen. I couldn’t put the book down, and I didn’t know why. It wasn’t until about halfway through that I realized I was being pulled in by the strength of the story, not by the author’s mastery of prose. Good writing makes you forget that what you’re reading was created by another human being. It doesn’t call attention to itself. 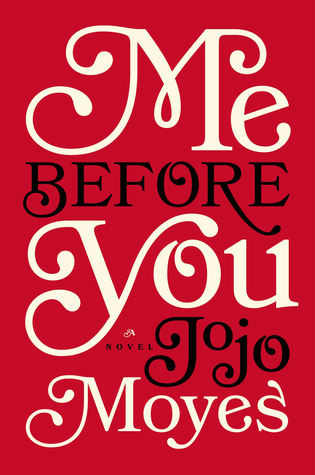 And while it’s clear that Jojo Moyes knows what she’s doing as a writer, there were no moments of “wow, this is so well-written” with this book. To me, it didn’t feel written, didn’t feel like a work of fiction. It felt true to life and real in a way that some books haven’t. This authentic essence is what makes the book difficult to put down, if not almost impossible. All in all, I give Me Before You my highest praise. Although it’s a book in a genre I don’t normally enjoy, I loved every minute of it. And although (without spoiling), the ending left me shocked, it also felt entirely satisfying somehow. If you’re looking for an emotional, true-to-life read, I can’t recommend this book wholeheartedly enough. What did you think of Me Before You? How do you feel about emotional books?